Samsung Printer out of Toner? The toner cartridges for the Samsung CLP-510 series printers contain an internal page counter. It will stop printing once a certain preprogrammed page count has been reached. Usually this does not mean that the toner toner cartridge is actually empty. Depending on the average degree of toner coverage, the cartridges could still be used for many hundreds more pages. It also prevents the printer from using the cartridges even if they have been refilled with new toner. The toner cartridges contain a little board with a ST24C04 chip, which is a 4 Kbit Serial I²C Bus EEPROM. This is where Speer comes into play. It is a python script which can backup, restore and reset the content of that EEPROM. There are three contacts exposed on the side of the toner cartridge. Those three contacts need to be connected to the I²C-Bus of the Raspberry Pi. Speer is then able to read from and write back to the EEPROM. The script will in theory run on any other Platform which provides the smbus python package. 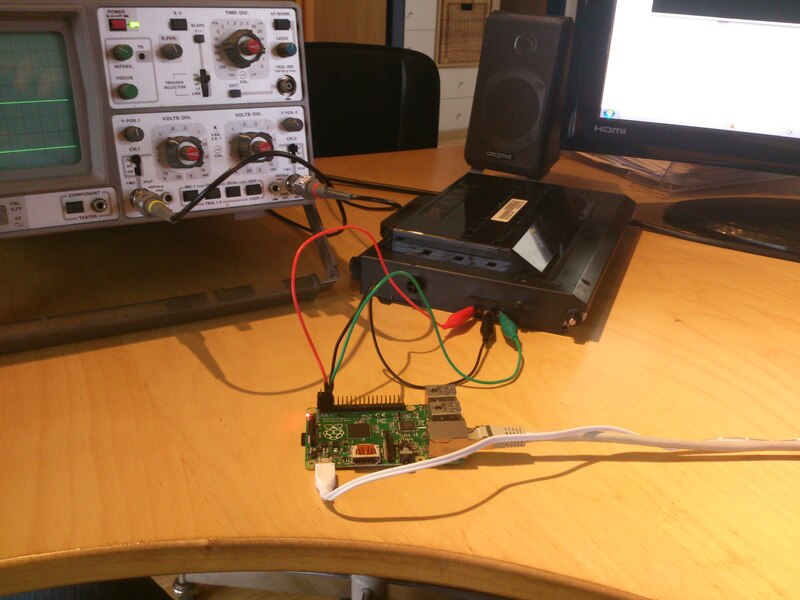 It was however only tested with a Raspberry Pi. 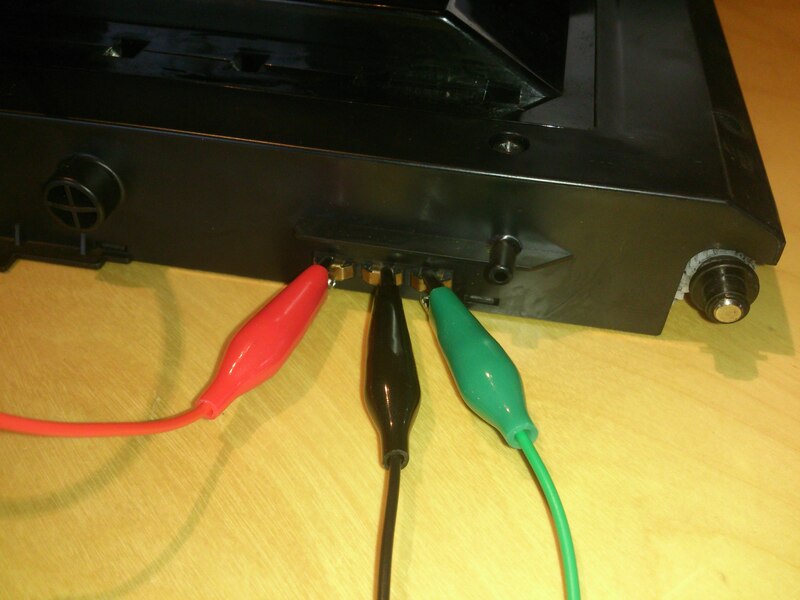 If you are interested in how this all works internally, you can also read my blog post Reset the Toner Cartridge of a Samsung CLP-510 with a Raspberry Pi. 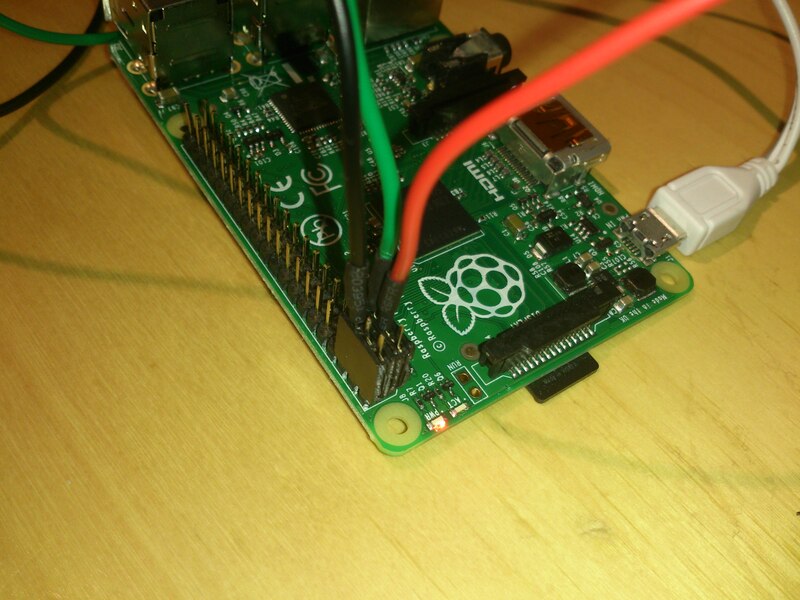 Note that the pictures above show a Raspberry Pi Model B+ which has a 40 pin GPIO header. The older models A and B have only 26 pins. The pin layout is however the same. 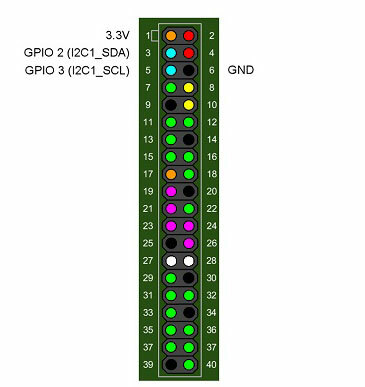 It’s also the pins 3, 5 and 6 that need to be connected with model A or B. In Advanced Options select and enable I2C. Speer tries to auto-dectect the address if the –addr argument is not given. 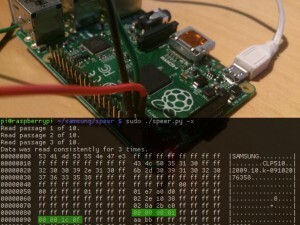 A wrong address might however be detected if there are other devices on the I²C bus. You can use argument -x to just display the content of the EEPROM as a hex dump. It should look similar to the example below. The first few letters should be SAMSUNG. Read passage 1 of 10. Read passage 2 of 10. Read passage 3 of 10. Data was read consistently for 3 times. The argument -b followed by a file name can be used to back up the content of the EEPROM to that file. It is important that you always BACKUP the content before doing any write operations. Backing up EEPROM to file black.bak. The argument -z is used to set the page count back to zero. Writing content back to EEPROM. If something went wrong you can restore the content of the EEPROM from a previously made backup. You can also make a backup of the EEPROM when the toner cartridge is new. And restore the backup once the cartridge has been refilled with new toner. This might be an option if you have a different printer model where the -z option does not work. Restoring EEPROM from file black.bak. Hi, I have a quick observation to share in relation to resetting the Samsung CLP-510 cartridges using SPEER. The default address of 0x56 works for the black cartridge only, at least in the ones I used. The other addresses used for the cartridges were 0x50 for yellow, 0x52 for magenta, and 0x54 for cyan. I hope this helps anyone that may run into any issues resetting all of their cartridges. Thanks for the wonderful tool and all the effort put in to figuring all this stuff out. Sorry for the late reply (only three month later). And thanks for that observation. I completely forgot to mention that. In the mean time I added an auto-detect feature for the I2c-address. So it should work now for all color cartridges without having to specify the address explicitly. I'd like to ask - will it works for printer Samsung CLP-415N ? I just looked at some pictures I found online about the CLP-415N. The toner cartridges look different then the ones of the CLP-510. And the counter board looks also very different. So I can't say if it'll work. Were you able to take a look at the counter board? Respectively, can you make out the markings on the chip? on the PCB is S3CT6P4 and directly on the chip is 4311H Q416. That looks like it is also using I²C to communicate. I am pretty sure my program will not work out of the box for your chip. Unfortunately, I²C is just a universal protocol. You'd need to know more about the device you are talking to. If you are lucky, it is just talking straight to an eeprom, like in my case. But it could also be more complicated (the toner board could even contain it's own microcontroller). I will try to use i2cdetect, but I doubt, that I can use eeprog 0.7.6-tear12, a 24Cxx EEPROM reader/writer... Do you know about any alternative for S3CT6P4 EEPROM Chip? Thank you for your time.I really appreciate it!!! Yes, let me know if you'll have some progress with i2cdetect. I googled again for S3CT6P4 and 4311H. I didn't find any data sheets. Maybe they relabeled the chip. I found some russian sites which seem to offer a universal programmer for toner chips. And it was mentioned that S3CT6P4 uses encryption. If that is the case, then you might get stuck, even if you can read/write to the eeprom. However, I have a Samsung ML2164 Monochrom. How can I reset the page counter? Is there a program/device for Samsung CLX-4195FW printer cartridges? Sorry, I am only familiar with the CLP-510 series. Try googling for "CLX-4195FW toner reset chip". Looks like it's a patched firmware which bypasses the toner chip altogether. The third video is funny where they even tape off the toner chips. It's a payed service though. Stay alert of scams.